How would you calculate age when you want to know the age at that point in time? For example let’s assume my birthdate is Dec 1, 1974 and today is July 14, 2015. Using DateDiff and returning the year will calculate my age as 41 when in fact I’m considered 40 until Dec 1. 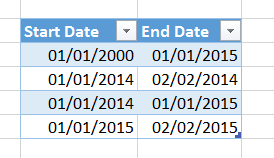 Using DateDif in Excel 2013 produces 40. TSQL will calculate 41. I’d be fine if all MS apps were consistent. You mean Excel 2016, not Excel 2013, right? In situations like this the best way of solving the problem is to do as much as possible in the model, and as little as possible in DAX. My advice would be to add a column to your Date table containing the number of working hours for each day, and then it would be simple to do your calculation by creating a Sum measure on that column. I am faced up with the same problem as Matt described. For example, if my birthdate is Sep 16, 1993 an now is June 6, 2017, DateDiff(09/16/1993, 06/06/2017, YEARS) returns 24. But as I know, I am 23 now (until Sep 16, 2017). So, how do you think what is the best way to calculate the age correctly? Chris I used your syntax, and it seems to have worked. However, when I try to graph it, I get this error. MdxScript(model) (3,55) Calculation error in measure’aztecaREQUEST'[HOURDURATIONMEASURE]: A date column containing duplicate dates was specified in the call to function ‘FIRSTDATE. This is not supported. how to Calculate the no of days between two dates using POWER PIVOT 2013. I need your help on this below scenarios, We have data in column Date ,A and B.
until the result value get zero or -ve. once you get zero then need to divide the previous value of result and corresponding vale of B . which i am highlight as red color. data will be weekly so this calculation will work if i select any week. so ,this should be in measure. not by calculated column.